Everyone knows about the Marvel and DC comics, but my favourite hero is Black☆Star, THE ONE WHO WILL SURPASS GOD! 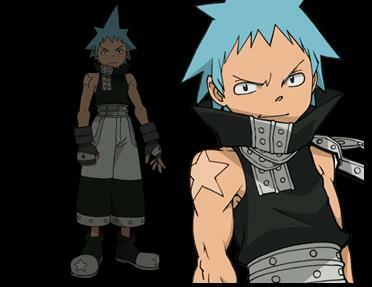 Black☆Star is from the Manga/comic/Anime ‘Soul Eater’. He is one of the main characters and he is one of the strongest Meisters’. There are many reasons why Black☆Star is the greatest hero and one of my favourites. At the beginning of the series, Black☆Star starts off as rather arrogant, loud, immature and egotistic. Although he fights as an assassin, he prefers to forget the Way of Assassination by shouting and making his presence known, the reason being that he is a massive attention-seeker. Black☆Star comes from a long line of assassins known as the Star Clan. The clan was known as a group of assassins who did anything for money. They victimised people in many areas, killing many innocent people, which made them infamous in various places. Due to their actions, the entire clan was exterminated by Shinigami thirteen years prior to the series. Black☆Star, who was still an infant at the time, was taken in by Shibusen, where he was raised by Sid Barett. He showed skill and talent in his abilities from a very young age, but was still ostracised by many, blaming him for everything that the Star Clan had done in the past. Despite his rather large ego, there are more positive sides to his personality. Although it is hard to tell through his arrogance, he does genuinely care for his friends. He always arrives to his friends’ aid if they are in danger, seeing himself as a protector of the people whom he classes as weaker than him. It is shown in team battles, that he views the safety of his friends as a priority. However, he will also take his friends’ wishes into account, and will step back and allow them to fight alone if they want to. He also has a determination that knows no bounds. He constantly trains to become stronger, and is dedicated on his goals, putting all of his effort in everything he does. Black☆Star is noted to be the fastest Shibusen, surpassing Kirikou. His agility and speed were almost to a superhuman level, as he was able to run 100 meters in less than six seconds, jump from tree to tree, and dodge multiple attacks with ease. Aside from his speed, Black☆Star is also incredibly strong and has great stamina; being able to endure punishing physical workouts such as five hundred one-handed press ups. His Soul Menace attacks get so strong, that even Stein, the strongest and most experienced Meister, cannot negate his Wavelength. His soul itself is stronger than average, and like his body, can take a lot of punishment. I also love him because, his personality is pretty similar to mine and because of that, it is easier to relate to him. He has a very positive and upbeat temperament, although he has his short-tempered and cheeky side. He is often found laughing and smiling even in the glummest of situations. His cheerful demeanour can sometimes act as a support to others when they are down. With the help of his weapon, Tsubaki, he defeats many Kishins and helps protect the weak humans. Thus making him an amazing hero and that is why he is one of my favourite heroes. Hehe, sucked in! I look like Tsubaki and you don’t look like anyone. *Shoots* Oops… My fingers slipped. My mornings start with a cup of coffee with cream. *random starts talking about-* FOOL! I really enjoyed the originality of this post – your selection of Black Star was very interesting, but you also provided a wealth of information about anime and what makes the genre and its heroes different to the typical American comics and superheroes. A few times you use conjunctions to start sentences, and I would like to see you avoid that in future – although and thus should be used a conjunctions rather than sentence openings. Overall this is an engaging post. Well done.